Saison’s have become a very popular style recently. This style arises from the ales brewed by farmers in Wallonia, currently southern Belgium and northern France. They were intended to be refreshing beers to be consumed by the farmer and his hired hands (“saisoniers” in the local dialect) during the late summer and early fall during the harvest. Originally lower in alcohol and very dry, hoppy, and refreshing, they have become more alcoholic over time, but the dry and refreshing parts are still key. These were originally warm weather beers, but were brewed out of what they had at hand on the farm, so varied tremendously from area to area, or even farm to farm. I think this lead to part of the appeal for modern brewers, as there is much room for interpretation on the style. The classic is Saison Dupont from Belgium, but you can find some good examples from US brewers as well, such as Hennepin from Ommergang in Cooperstown, NY. This is another style, like most of the Belgian beers, where yeast is critical. You have to use a saison yeast, or, well, you don’t get a saison. These yeasts are very aggressive fermenters, leaving a very dry beer. They also produce a ton of esters and phenols, which give you the fruity and spicy notes. Tropical fruit, black pepper, and cloves are all flavors you will find in saisons from the yeasts, as well as often some wild brettanomyces thrown in. Also, they often are fermented at high temperatures. Saison Dupont is fermented at over 90F. In his excellent book “Farmhouse Ales” Phil Markowski suggests that these were probably wine yeasts that ended up being adapted for brewing. When you look at a map, Wallonia is very close to Champagne, so this would make sense. OG: 1.062, FG: 1.016, ABV: 6%, IBU: 25.4, Mashed at 148F for 90 minutes. Tasting: Highly carbonated, cloudy, golden/orange color. Aroma: Pineapple/tropical fruit and bananas I can smell first, with some floral notes, probably from the Saaz. Taste: the banana taste is what I perceive initially, with that spicy/clovey taste you get from many Belgian yeasts in the background. The mouth feel is a little thick, and there is a slight, malty sweetness I can taste at the end, balanced by a nice hop bitterness. Comments: This beer did not ferment enough. This yeast strain (reported to be the Dupont strain and the same as WLP 565) is renowned amongst home brewers for getting “stuck” around 1.020, when it should end up well below 1.010. I started fermenting this beer around 70F, and then ramped up the temperature over 10 days to 85F. I used a large tub filled with water, and used a fish tank heater to warm it up. I just put the carboy in this, and let it go. Despite this, and rousing the yeast a few times, it just sat at 1.016. I left this for 4 weeks at 85F, and about 5 weeks total in primary, until I finally gave up. I would also tweak the recipe a bit, and would have used more finishing hops, as I did not get as much of that hop character on the nose I was hoping for. Also, I am not going to use this yeast again. 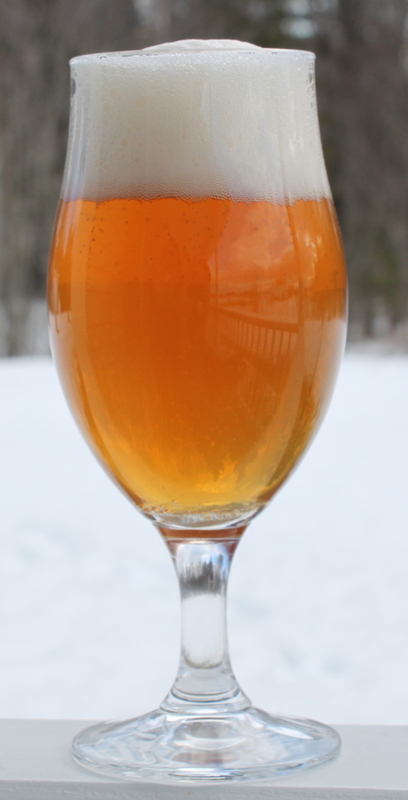 Wyeast 3711 is another saison strain that is much more tolerant of lower temperature, and can ferment completely (well under 1.010) without additional heat needed. I would use that, or a East Coast Yeast strain in the future.